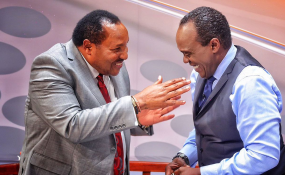 Kiambu Governor Ferdinand Waititu with Citizen TV anchor Jeff Koinange. Kiambu Governor Ferdinand Waititu on Wednesday denied ever having done any hard drugs in his life. The Kiambu governor was responding to claims made by Nairobi Governor Mike Sonko last week that thy used to hide in a toilet in parliament and smoke bhang during their days as Members of Parliament. Waititu, commonly known as Baba Yao, appeared on Citizen TV's JK Live show and said that he stands firm against illicit brews in his home county which is a testimony of his resolve against drugs. He termed Sonko as a joker which is why he did not take any legal action against him for the slur. "In fact, if such utterances came from someone else, I could have gone to court over defamation. But since they came from him and I know him, I know why he said it. I also don't take him seriously," Waititu said. Last week, on the show Sonko claimed that Waititu used to hide bhang in his socks. However, Waititu said he is a respectable man who could not have done such a thing. "It is very disappointing to hear such words coming from somebody who is entrusted with the lives of over 4 million people in Nairobi. It is high time that he becomes serious. He is a leader now; he shouldn't be a joker anymore. I am a respectable parent, a serious person. I thank God for the far He has brought me. I am serious person, who sometimes never looks very serious; and you don't have to be serious every time," added Waititu.